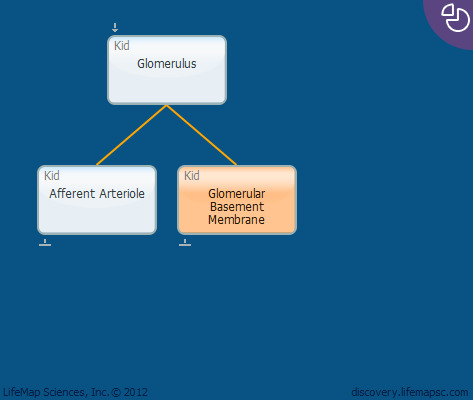 The glomerular basement membrane (GBM) is formed at the boundary of the basal laminas of the podocytes of the glomerulus and the endothelial cells of renal capillaries. It is an acellular, extracellular matrix layer organized into three sublayers — the lamina densa, lamina rara interna, and lamina rara externa.The lamina densa is a relatively homogeneous extracellular matrix layer, whereas the laminae rarae is less dense and contains anionic sites. The GBM is covered by podocytes, epithelial cells whose extending foot processes interdigitate to create the slit diaphragm, a unique type of tight junction. The GBM and the interdigitating podocytes separate the capillary bed from the urinary space. The slit diaphragm maintains a specific pore size such that only molecules smaller than approximately 5000 daltons can traverse the filtration barrier and enter the urinary space. The GBM is composed of glycoproteins (laminins, typeIV collagen, entactin/nidogen) and proteoglycans (agrin, perlecan). The GBM has been assumed to have the properties of a viscous gel. On the other hand, the slit diaphragms that bridge the filtration are actually specialized cell junctions with properties of shallow adheren junctions that are unique from typical junctional complexes.